On Saturday, I spent a ridiculous amount of time outside in a park in the cold, selling children’s books and running around and meeting authors with absolutely nothing knitted to present to them (I know. I’m ashamed of myself enough for everyone, don’t worry.) 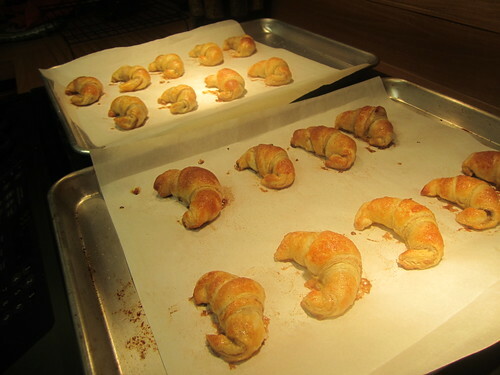 Then, I decided that the best thing to do (instead of sitting down with hot tea and studying and going to bed early, like a normal person would do) would be to spend my evening making chocolate-filled croissants to give to my co-workers at 7 am the next morning. I am full of great ideas. 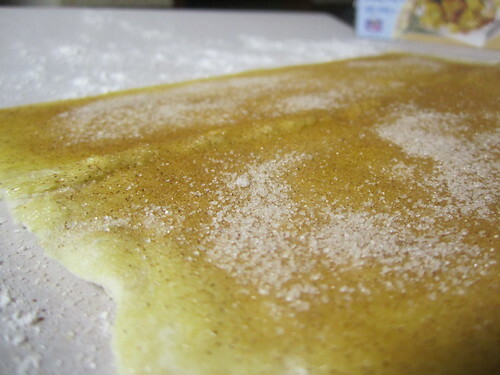 Especially if they involve egg wash and extreme amounts of cinnamon and sugar. 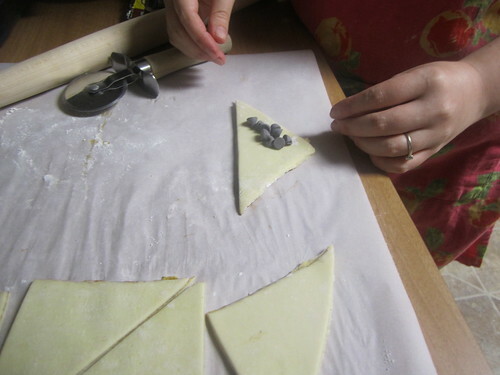 It had already been a MONTH since I got Joy the Baker‘s new cookbook (and blogged all about how I made her a cat toy), and I still hadn’t made anything from it. I clearly need to sort out my priorities. 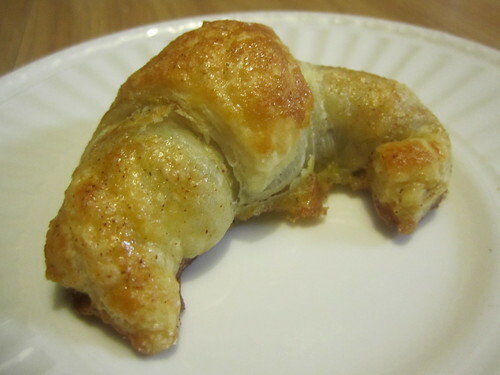 There is an excellent recipe in Homemade Decadence that really embraces the title to me, the Cinnamon Sugar and Dark Chocolate Croissants. 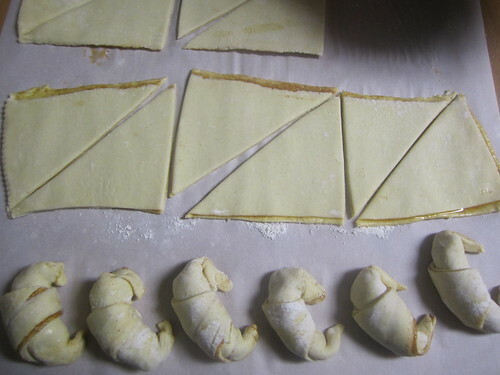 In this recipe, we can pretend that we are together enough in our lives to be able to whip up puff pastry at a moment’s notice, simply by purchasing boxes of puff pastry and defrosting them a few hours before we want to make croissants. Such elegant deception. 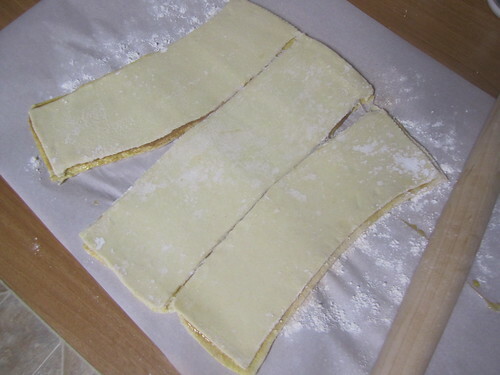 I ran into a bit of a problem here, as the puff pastry did not want to defrost. Apparently, in addition to my oven being a lying liar and not being nearly as hot as it claims to be, my refrigerator must also be much, much colder than it should be. 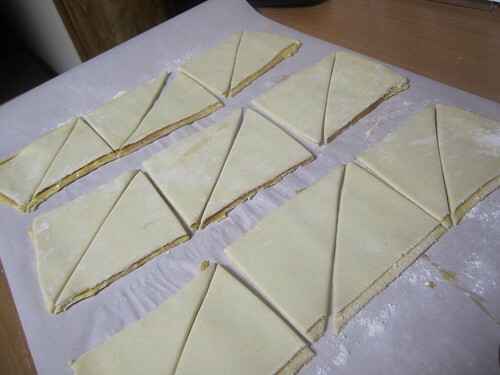 I let these puff pastry sheets defrost for 3 hours, and they still had ice crystals and folded creases that made them split into 3 sections, rather than the 4 that Joy wanted me to cut them into. 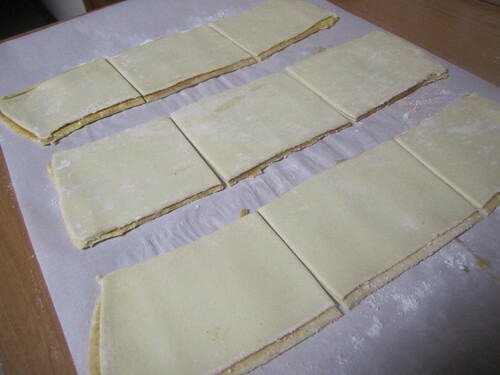 I felt personally responsible for the obstinance of these damn puff pastry sheets, as though I was letting Joy and the entire blogging and somehow Barnes & Noble family down by not being able to control the thawing time of butter and flour. It gets weird in my head sometimes. Life snapped back into focus, and I decided to roll with it and made a 3×3 sheet to get 18 slightly smaller croissants than the 4×2 sheet described. 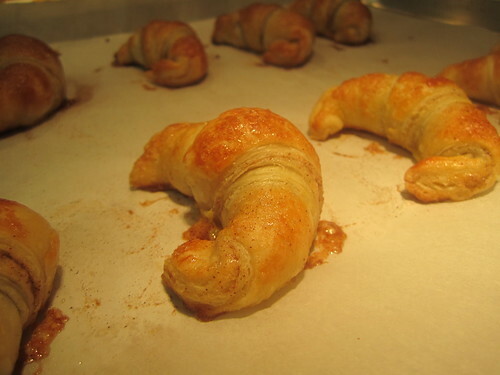 Well, smaller croissants are better than no croissants, as the time-worn saying goes. I swear that I wasn’t deliberately trying to flip off the camera in that one. Before and after. 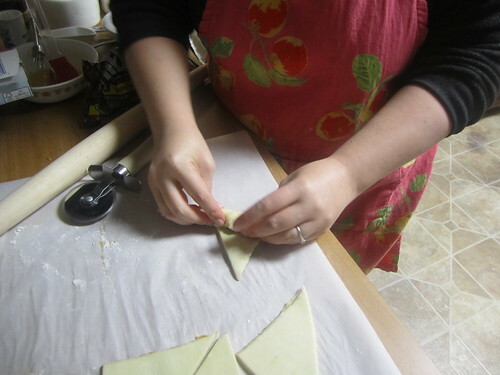 I really enjoyed how neat and tidy and efficient the pastry-rolling process made me feel. 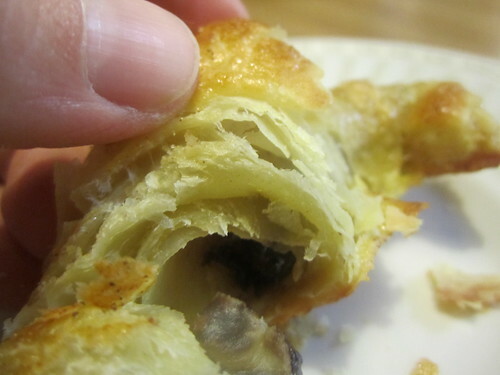 Basically, the idea here is that a layer of cinnamon and sugar is sandwiched between 2 sheets of flaky puff pastry, which are then cut into triangles and rolled around dark chocolate chunks to form a flaky, crunchy, sweet chocolate delivery device, perfect for adding to a breakfast buffet line. 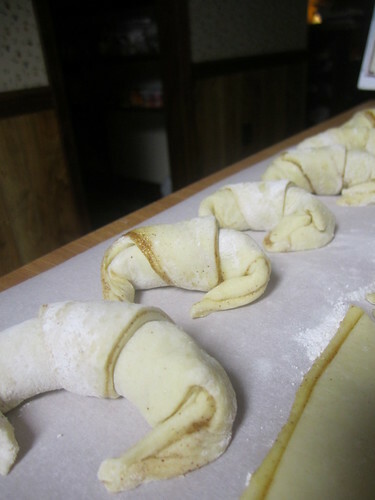 Cutting them out, rolling them up, and sprinkling them with cinnamon, sugar, and sea salt makes you feel super fancy, which is a big bonus in my book. 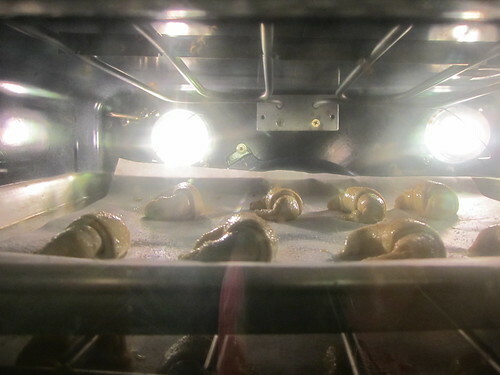 Then, you put them into your lying, cheating oven and bake them until they are done (which in the real world is somewhere between 12-15 minutes, and in my kitchen topped out at 21-24…I need an oven thermometer for Christmas, you guys. It will prevent me from dismantling the thing with a screwdriver and malice in my heart). Flaky and brown and crisp on top. 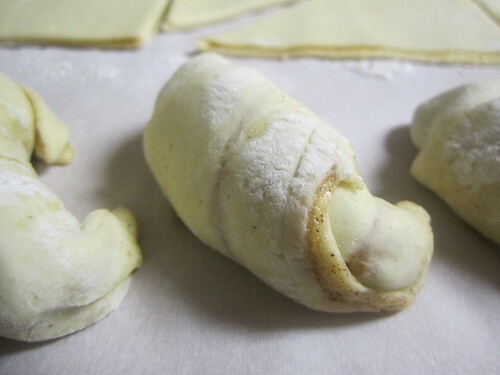 Dang, you fancy, mini-croissant. I had to sample one, of course. To make sure it was not burnt. It’s a chef’s thing. 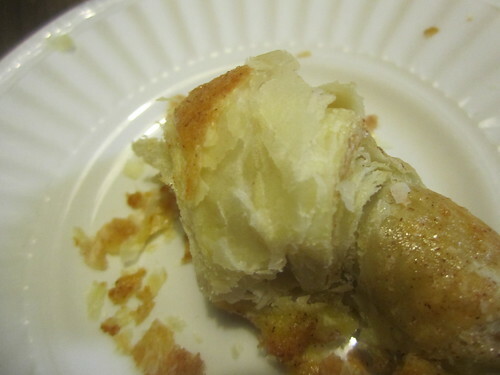 Lots of flaky layers and creamy chocolate inside. Hooray! 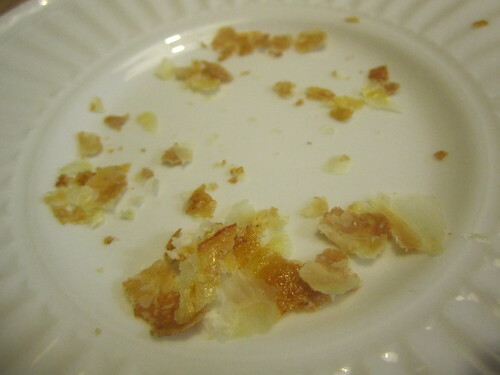 Unfortunately, it was gone in seconds. Slightly longer, maybe, because I was taking pictures. To add to the pain, I wasn’t allowed to have anymore because they had to make an appearance at an event the next morning. 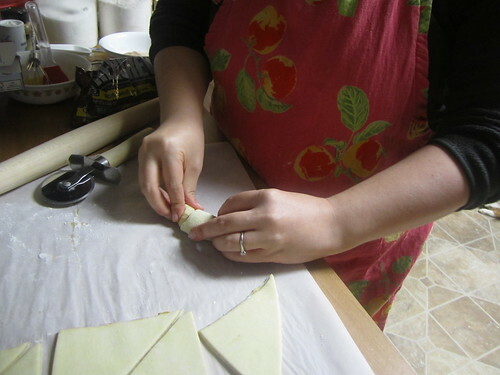 I’m definitely going to do this again, and maybe only make 4 giant croissants, filled with chocolate or almond paste. That would certainly be decadent, and I would go out of my way not to share with anybody. That would certainly be the mature thing to do. You should all go out and buy Homemade Decadence and do the same.